Disclaimer: Before performing any upgrades on your computer, be sure to take the proper precautions to prevent electrostatic discharge and read the manufacturer’s recommendations carefully. 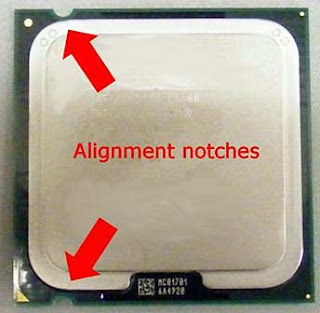 Avoid touching the metal contacts on the processor, or the pins on the motherboard. 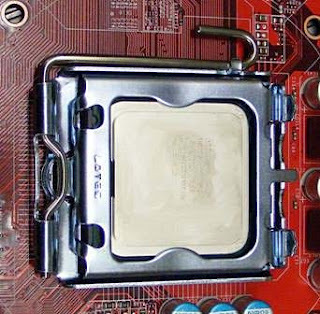 The CPU or Central Processing Unit is the brain of the computer. All commands for data or calculations pass through the CPU. The current Intel form factor is called “LGA 775”. 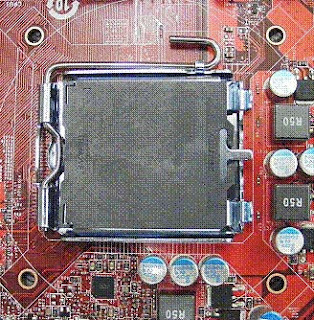 The main difference between this form factor and the previous type is that there are no pins located on the processor. 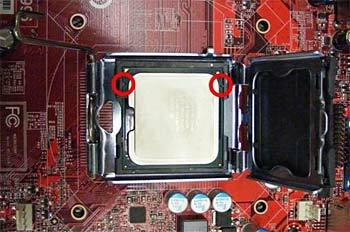 Instead, there are contact areas that are touched by pins located on the motherboard socket itself. 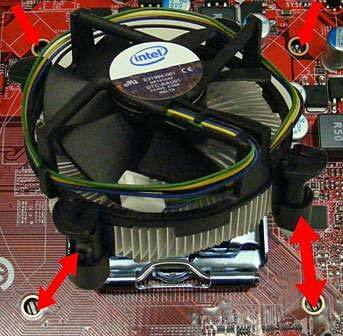 This article will show you how to install an Intel CPU and heatsink. 1. 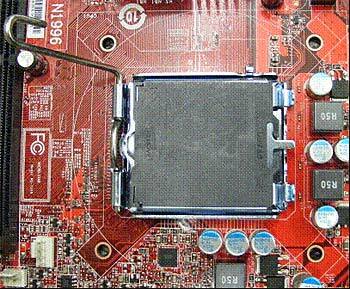 Locate the processor socket on your motherboard. 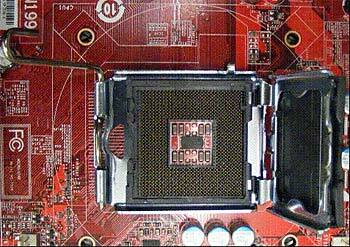 The color and exact placement of your motherboard may differ slightly. 2. Lift the lever attached to the side of the socket cover. 3. Lift the metal cover with the plastic insert. It will pivot up and out of the way. Some socket covers do not move with the metal plate. If it remains over the socket, lift it out of place and set it aside. 4. Look at the CPU to locate the alignment notches. These notches will fit around small tabs located in the socket. 5. Gently place the CPU in the socket lining the notches on the processor up with the tabs in the socket. When the processor is correctly placed, the gold triangle should be pointing at the lever. The CPU should be flat and stable in the socket. 6. Lower the metal cover. Apply a bit of pressure on the plate and rotate the lever back down towards the motherboard. Slide the lever under the small tab to secure it in place. If the black plastic socket cover was still attached to the plate, it should pop loose at this time. Set it aside. The CPU is now installed in the socket. The next steps will show how to add a heatsink to keep it cool. 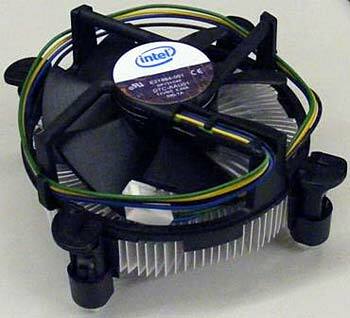 The Heatsink is vital to the overall health of your CPU. 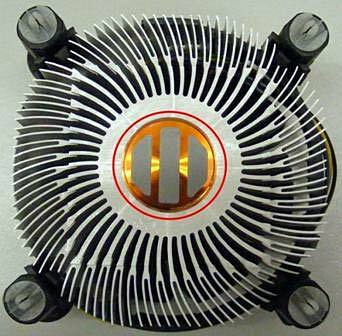 The heatsink is designed to take the heat generated by the processor and dissipate it to keep the CPU running cool and efficiently. There are a number of different styles and types of heatsinks. This section of the guide will reference a stock Intel heatsink. 1. Check the CPU for thermal compound. Thermal compound is necessary to create a tight bond between the heatsink and processor. Intel heatsinks have compound pre-installed. 2. Align the 4 clips on the heatsink with the holes on the motherboard. Place the heatsink on top of the processor keeping the clips and holes aligned. 3. Press the 4 clips downward until they click latching the heatsink to the motherboard. 4. 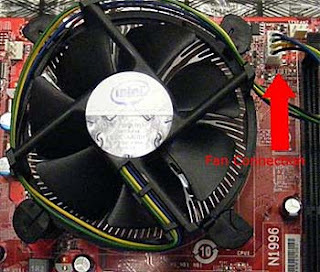 Connect the fan cable to the CPU fan connector on the motherboard. This is normally labeled CPUFAN or something similarly.